Sandia and Los Alamos national laboratories scientists already are analyzing reams of data being downloaded from the 7-foot high FORTE satellite, orbiting 500 miles above the Earth. Four times a day the satellite passes within communicating distance of the Sandia National Laboratories ground station at the Labs' New Mexico site. Although Sandia has developed and monitored satellites in the past, this is the first time the Labs has actually controlled a satellite's operations. FORTE (Fast On-orbit Recording of Transient Events) was developed jointly by Sandia and Los Alamos and sponsored by the Department of Energy's Office of Nonproliferation and International Security. It will test new ways of spotting secret nuclear weapons tests and gather data on the physics of lightning and the ionosphere. The satellite was sent into orbit the morning of Aug. 29 by a Pegasus XL rocket launched from an L-1011 aircraft flying at 40,000 feet above Vandenberg Air Force Base in California. The FORTE launch vehicle and launch services were provided by the US Air Force Space Test Program (STP), an integral part of the Space and Missile Systems Center, Test and Evaluation Directorate (SMC/TE) at Kirtland Air Force Base, N.M. FORTE carries a payload of three instruments: an advanced radio frequency impulse-detection system, an optical lightning system, and an "event classifier." The Los Alamos-designed radio frequency sensor system consists of a 35-foot-long antenna and three broad-bandwidth receivers that will detect, record, and analyze bursts of radio energy rising from Earth's surface. The system will help researchers determine how the ionosphere affects the propagation of radio frequency signals. LANL also developed the satellite vehicle and has overall project management responsibility. The Sandia-designed optical lightning system detects, locates, and characterizes lightning flashes. Such data will help global climatologists correlate lightning flash rates within thunderstorms to precipitation rates. This information combined with the radio frequency emission data can help explain the atmospheric breakdown mechanisms that lead to lightning discharges. Sandia also developed an adaptive device that detects and filters out television and radio signals so that the system can better detect bursts of radio energy. The LANL event classifier is a set of adaptive processors that can distinguish lightning from man-made electromagnetic signals. It is a key technology in detecting secret nuclear weapons tests. "You can calibrate these instruments in the lab, but it's really not until you get them out into real world conditions that you can tell how they're going to operate," says JosŽ Guillen, FORTE project manager for Sandia. Throughout the one- to three-year life of the satellite, Sandia and Los Alamos scientists will download data at the Sandia ground station each of the four times a day it sweeps overhead. 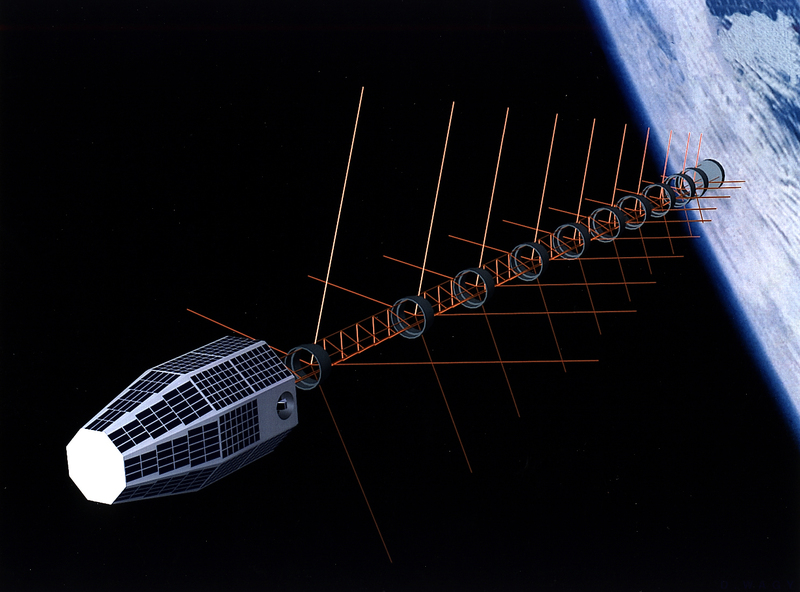 The satellite must be at least 10 degrees above the horizon for adequate communications. At an altitude of 500 miles, its communicating range actually extends from several hundred miles out in the Pacific Ocean to Ohio, and from Seattle to Mexico City. A typical pass lasts from 12 to 15 minutes. Guillen says the optical lightning system is functioning well, although it is still in the "tuning" phase to ensure every lightning event it picks up is valid. In one recent orbit the system detected 1,800 lightning events worldwide. Sandia's role in FORTE began in June 1992 with the formation of the team to develop the optical lightning system. Among the Sandians now staffing the ground station besides Guillen are Jim Snell, Raivo Leeto, and Bryan Ingram, who all serve as ground station managers. From LANL's Nonproliferation and International Security Division are project leader Stephen Knox, mission operations manager Diane Roussel-Dupre, and project software engineer Phil Klingner. Sandia is a multiprogram DOE laboratory, operated by a subsidiary of Lockheed Martin Corp. With main facilities in Albuquerque, N.M., and Livermore, Calif., Sandia has major research and development responsibilities in national security, energy, and environmental technologies and economic competitiveness.